They grow up so fast... Welcoming your new baby into the world is one of the most emotional and wonderful times in your life! Photography has the power to transport you back to those incredible moments, to bring back the emotions we experience at a particular moment in our lives. These portraits will be some of your most treasured possessions. We believe every stage in your children's lives should be celebrated and captured with professional photography; but capturing newborn babies is something truly special. Your family will treasure these images forever! Connie Mintz Portrait Art is conveniently located in downtown Vancouver, WA, serving Portland, Oregon, Southwest Washington and surrounding areas. Have you have been trained in the safe handling while photographing newborn babies? I take working with your little ones very seriously. I have invested in training specifically geared towards the safe handling and posing of newborns. I have trained along-side one of the most respected newborn photographers in the world and have taken more classes than I can even keep track of. 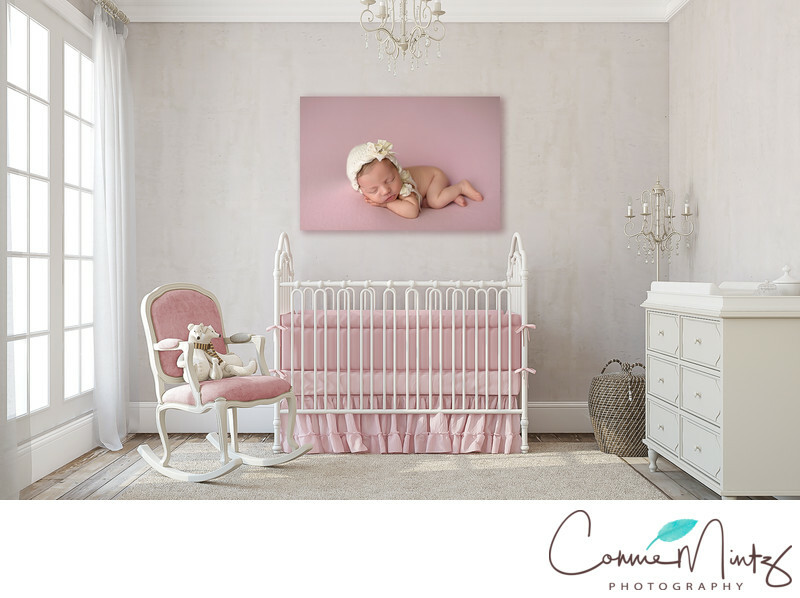 So much goes into getting the perfect images of your newborn. Lighting techniques, styling, posing, and attention to all the little details combined to create breathtaking portraits. Please read my article on, How to Choose a Newborn Photographer. Our studio normally books out two months in advance, so it is best to book in your newborn session while you are still pregnant. Once booked, we will pencil in your due date on the calendar. Then as soon as baby arrives, you let us know so that we can schedule the exact date and time of the session. Newborn sessions are recommended to be done in the first 21 days of life (preferably between 7 to 14-days-old), so it is imperative that you contact us as soon as possible after your little one arrives to schedule your session. After they pass the 14-day mark, they become less sleepy and more difficult to pose. If you happen to stumble across this site after your baby is born, we will do our best to try to squeeze you in before the 14-day mark, and can normally accommodate newborn sessions up to six weeks of age, pending availability. If you have missed the six-week mark, there are plenty of other options for beautiful sessions for your little one. Please contact us for further details on booking a session for babies aged 4-12 months. Is it possible for my partner, children and dogs to be included in the session? Parents, sibling and pet portraits are always welcomed and encouraged during the newborn session. The session are typically scheduled for 10am and can last 3-4 hours, especially with family and siblings. Therefore, we recommend that you make arrangements for young chidren to leave the studio after they are photographed. Props and accessories are included in your session. We choose only the highest quality headbands, hats, wraps and fabrics that we can find, and prefer natural cottons, wools and fibers. This also means that we have searched high and low for the best quality props from some of the most trusted and sought after vendors in the industry. Everything is purchased with safety in mind. From soft Alpaca bonnets to cozy angora rompers; I pay close attention to potential irritants to your new little one’s skin. 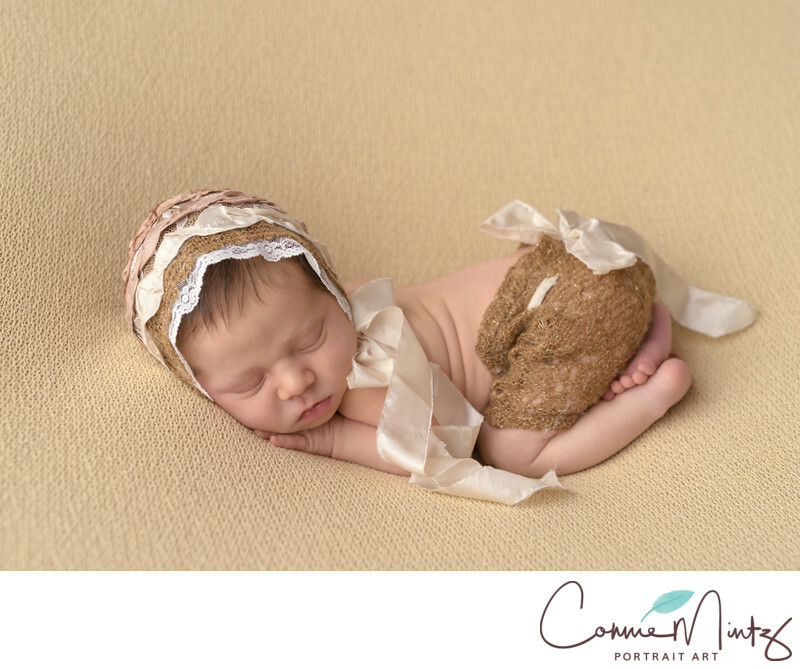 Our style is contemporary and simple, best for portraying your baby as the main focus. Please send us an inquiry form and we will get back to you. Please include your estimated due date. Otherwise feel free to call us to discuss your session and get you scheduled.